It's time to revisit the "13 Bugs of Christmas!" Back in 2010, two innovators with the UC Davis Department of Entomology (now the UC Davis Department of Entomology and Nematology) decided that "The 12 Days of Christmas" ought to be replaced with insects. Remember that iconic song, "The 12 Days of Christmas?" Published in 1780, it begins with "On the first day of Christmas, my true love gave to me, a partridge in a pear tree?" Eleven more gifts follow: "2 turtle doves, 3 French hens, 4 calling birds, 5 gold rings, 6 geese-a-laying, 7 swans-a-swimming, 8 maids a'milking, 9 ladies dancing, 10 lords-a-leaping, and 11 pipers piping." The two innovators--Extension apiculturist Eric Mussen (with the department from 1976-2014 and now emeritus) and yours truly (with the department since 2005)--decided that "5 gold rings" ought to be "five golden bees." 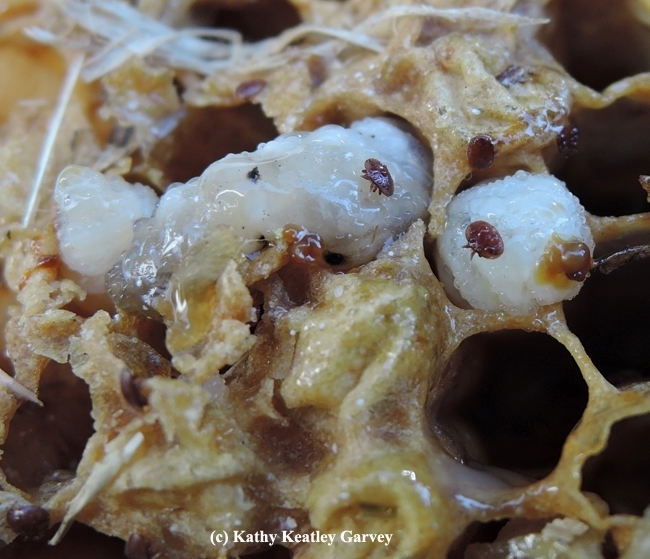 The duo also figured that varroa mites, and other pests of California agriculture, should be spotlighted. Don't know what happened to the varroa mites! Hey, Eric, where did you put the varroa mites? They penned the lyrics for the department's holiday gathering. Then Mussen, who sings with a Davis-based doo wopp group, led the department in song. That was supposed to be the end of it. Not so. It went viral when U.S. News picked it up. On the first day of Christmas, my true love gave to me, a psyllid in a pear tree. 10 Tropilaelaps clareae, 9 melon fruit flies, 8 Aedes aegypti, 7 ash tree borers, 6 six spotted-wing Drosophila, 5 five gypsy moths, 4 Japanese beetles, 3 imported fire ants, 2 brown apple moths, and a medfly in a pear tree." 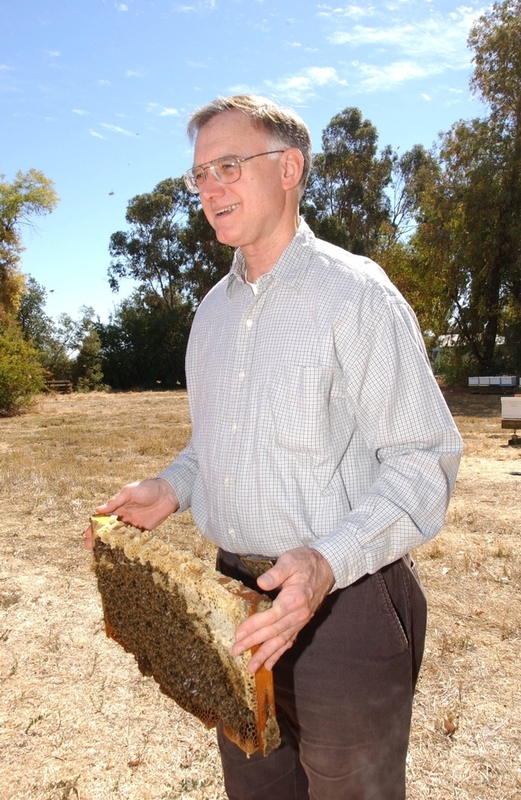 Mussen, although retired in 2014, keeps bee-sy. A co-founder of Western Apicultural Society (WAS), he completed his sixth term as president in 2017. WAS, which serves the educational needs of beekeepers from 13 states, plus parts of Canada, was founded in 1977-78 for “the benefit and enjoyment of all beekeepers in western North America." On the 12th day of Christmas, my true love gave to me, twelve guava fruit flies. The two innovators--Extension apiculturist Eric Mussen (with the department from 1976-2014 and now emeritus) and yours truly (with the department since 2005)--decided that "5 gold rings" ought to be "five golden bees." Why not? They also figured that varroa mites, and other pests of California agriculture, should be spotlighted. Now it's time to revisit "The 13 Bugs of Christmas:"
And a medfly in a pear tree." And a grapevine moth in a pear tree." It's a buggy kind of Christmas. Mussen/Garvey style. You've heard "The 12 Days of Christmas," beginning with a single "partridge in a pear tree" and ending with "12 drummers drumming." In between: two turtle doves, three french hens, four calling birds, five gold rings, six geese-a-laying, seven swans-a-swimming, eight maids-a-milking, nine ladies dancing, 10 lords-a-leaping, and 11 pipers piping. But have you heard "The 13 Bugs of Christmas?" Back in 2010, Extension apiculturist Eric Mussen of the UC Davis Department of Entomology (now the UC Davis Department of Entomology and Nematology) and yours truly came up with a song about "The 13 Bugs of Christmas." Presented at the Department of Entomology's holiday party, it drew roaring applause. Then U.S. News featured it when reporter Paul Bedard picked it up. It's still making the rounds, via social media, and it's also appeared in number of pubications, including a pest control magazine. 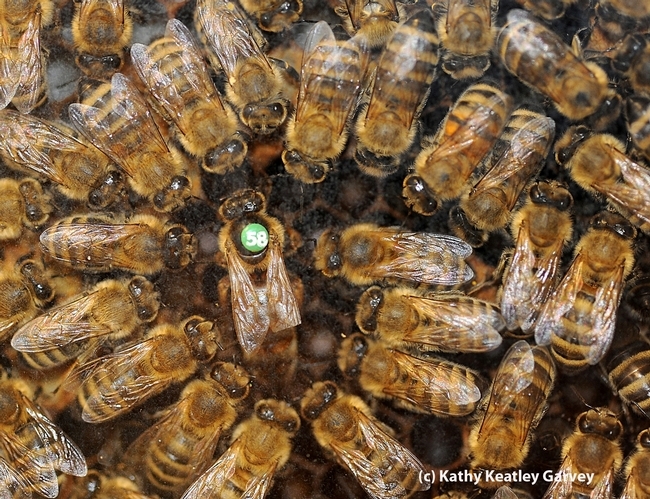 "The 13 Bugs of Christmas" is about a psyllid in a pear tree, six lice a'laying, 10 locusts leaping and 11 queen bees piping. Beekeepers know that distinctive sound of a queen bee piping. 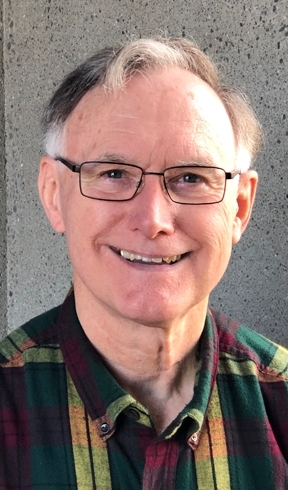 "We attempted to keep the wording as close as possible for ‘The 12 Bugs of Christmas' and then we opted to spotlight some new agricultural pests in the next stanza," said Mussen, who retired in June 2014 after 38 years of service. 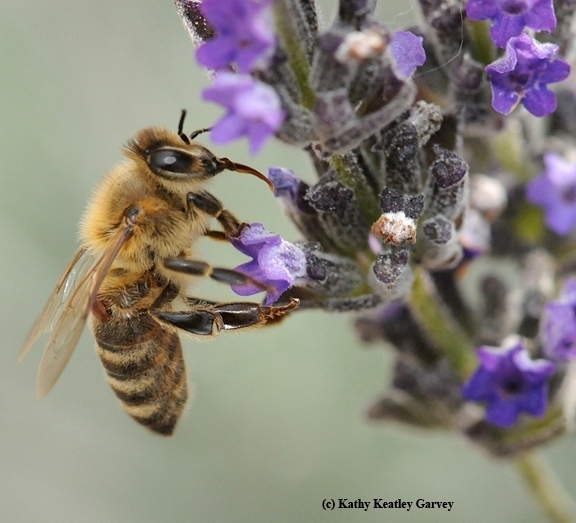 Mussen noted that Tropilaelaps clareae is a honey bee mite from Asia, as is the well-known varroa mite (Varroa destructor), which was first detected in the United States (Wisconsin) in 1987 and is now beekeepers' No. 1 problem. It's time to revisit "The 13 Bugs of Christmas." You've heard "The 12 Days of Christmas," beginning with a single "partridge in a pear tree" and ending with "12 drummers drumming." In between: two turtle doves, three french hens, four calling birds, five gold rings, six geese-a-laying, seven swans-a-swimming, eight maids a'milking, nine ladies dancing, 10 lords-a-leaping, and 11 pipers piping. It's still making the rounds, via tweets. "We attempted to keep the wording as close as possible for ‘The 12 Bugs of Christmas' and then we opted to spotlight some new agricultural pests in the next stanza," said Mussen, an Extension apiculturist with the department since 1976 who writes the bimonthly from the UC apiaries newsletter. He will be retiring in June 2014. Mussen, who retired this year after 38 years of service, noted that "Tropilaelaps clareae" is a honey bee mite from Asia, as is the well-known Varroa mite (Varroa destructor), which was first detected in the United States (Wisconsin) in 1987 and is now beekeepers' No. 1 problem. 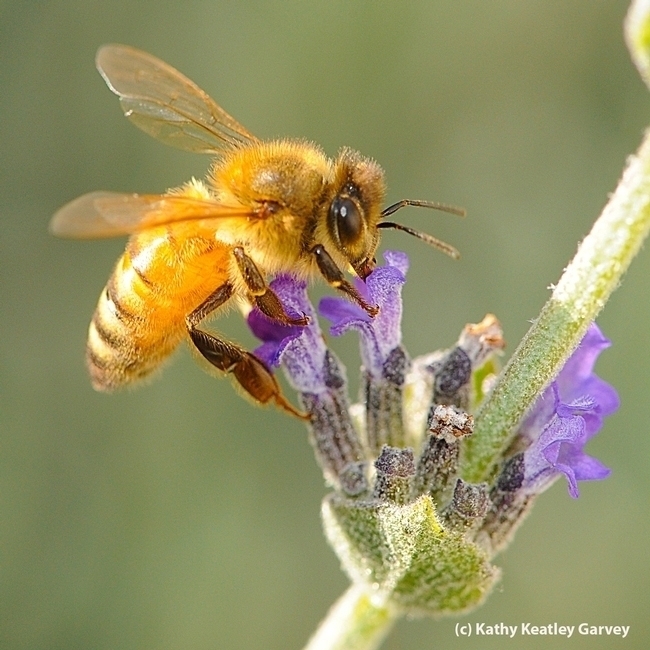 Mussen noted that "Tropilaelaps clareae" is a honey bee mite from Asia, as is the well-known Varroa mite (Varroa destructor), which was first detected in the United States (Wisconsin) in 1987 and is now beekeepers' No. 1 problem.